Text by Sergio Rodríguez Blanco, George Otis. Since 1985, photographer Phyllis Galembo has traveled extensively to photograph sites of ritual dress in Africa and the Caribbean. In her latest body of work, collected in this new publication, Galembo turns to Mexico, where she captures cultural performances with a subterranean political edge. Using a direct, unaffected portrait style, Galembo captures her subjects informally posed but often strikingly attired in traditional or ritualistic dress. Masking is a complex tradition in which the participants transcend the physical world and enter the spiritual realm. Masks, costumes and body paint transform the human body and encode a rich range of political, artistic, theatrical, social and religious meanings on the body. In her vibrant color photographs, Galembo highlights the artistry of the performers, how they use materials from their immediate environment to morph into a fantastical representation of themselves and an idealized vision of a mythical figure. 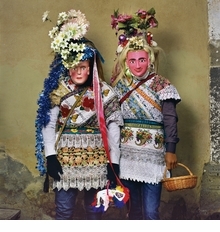 In a gorgeous, fascinating photographic survey of Mexico’s masking practices, Galembo captures her subjects suspended between past, present and future, with their religious, political and cultural affiliations—their personal and collective identifications—displayed on their bodies. Photographer Phyllis Galembo (born 1952) received her MFA from the University of Wisconsin–Madison in 1977, and was Professor in the Fine Arts Department of SUNY Albany from 1978 to 2018. A 2014 Guggenheim Fellow, Galembo has photographs in numerous public and private collections, including the Metropolitan Museum of Art and the New York Public Library. Her photographs of ritual masks in Africa, the Diaspora and beyond have been the subject of several monographic publications, including Maske (Aperture, 2016). Hardcover, 9.25 x 10.25 in. / 196 pgs / 120 color. For over two decades, Phyllis Galembo (born 1952) has documented cultural and religious traditions in Africa and the African Diaspora. Traveling widely throughout western and central Africa, and regularly to Haiti, her subjects are participants in masquerade events—traditional African ceremonies and contemporary costume parties and carnivals—who use costume, body paint and masks to create mythic characters. Sometimes entertaining and humorous, often dark and frightening, her portraits document and describe the transformative power of the mask. With a title derived from the Haitian Creole word maské, meaning "to wear a mask," this album features a selection of more than 100 of the best of Galembo’s masquerade photographs to date, organized in country-based chapters, each with her own commentary. 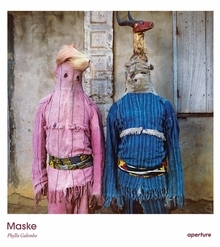 Now back in print by popular demand, the book is introduced by art historian and curator Chika Okeke-Agulu (himself a masquerade participant during his childhood in Nigeria), for whom Galembo’s photographs raise questions about the survival and evolution of masquerade tradition in the 21st century. Hardcover, 9.25 x 9.5 in. / 208 pgs / 106 color. The clothes we wear invariably telegraph information about our identity, our place in society and the stories we wish to convey about ourselves. 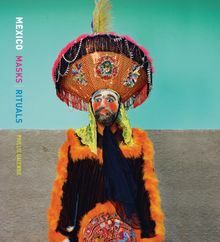 The fantastically colorful costumes specific to African and Caribbean rituals and celebrations go several steps further, transforming ordinary people into mythic figures and magicians, tricksters and gods, and symbolizing the roles their wearers play in the ancient dramas that form the cornerstones of their cultural heritage. Phyllis Galembo began photographing the characters and costumes of African masquerade in Nigeria in 1985, and since then she has continued developing her theme throughout Africa and the Caribbean. This volume collects 108 thrilling carnival photographs from Nigeria, Benin, Ghana, Sierra Leone, Burkina Faso, Zambia and Haiti. In magnificent color shots, Galembo's subjects pose in striped bodysuits that cover the entire body, including the face; or outfits made entirely of bunched greenery; or a lacquered wooden mask topped with a headdress featuring full-body models of other characters; or an oversize misshapen animal head and plywood wings. 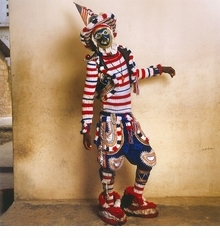 The carnival characters, rooted in African religion and spirituality, are presented in chapters organized by tribal or carnival tradition and are accompanied by Galembo's personal commentary, shedding light on the characters and costumes portrayed, and on the events in which they play a pivotal role. 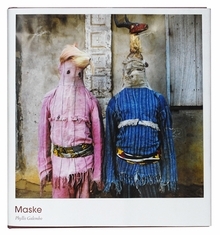 Maske is a serious contribution to ethnographic study, a photo-essay about fashion and an assembly of superb images. Hardcover, 8.75 x 9.5 in. / 208 pgs / 108 color.